Invasive buffel grass is joining fracking as a scourge in the public mind at this pre-election time, threatening The Centre’s lifestyle, and its prime commercial asset, the national parks. The NT Government is blissfully favouring one industry at the expense of another which is worth half as much: Official estimates put the annual earnings of tourism at more than $2b and those of the cattle industry – which is fighting tooth and nail the declaration of buffel as a weed – at about $1b. 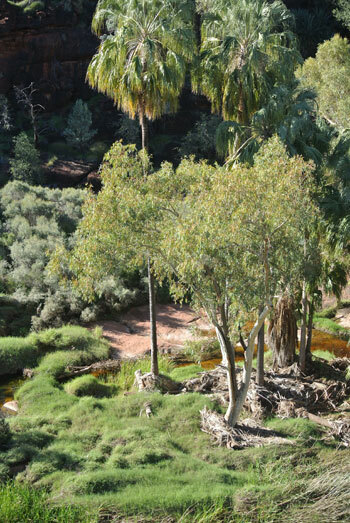 Meanwhile there is a massive outbreak of buffel in Palm Valley, with the parks service doing nothing remotely adequate to safeguard the town’s most significant natural attraction and economic asset, now that Uluru is providing little benefit for Alice Springs. “Buffel grass provides valuable pasture” claims NT Parks Minster Bess Price while south of the border the SA Government says “buffel is capable of destroying Australian ecosystems”. SA has been battling buffel for around two decades and last year declared it a weed, calling it a “pest plant”. At that rate the spend by Ms Price on weeds would have taken care of an area of buffel a kilometer long and 100 meters wide. Here’s another figure: On July 4 there were 582 people in the Alice Springs jail. Probably half of them are non-violent – the kind of prisoners who in the 1980s built the now iconic Larapinta Trail, 223 kilometres through the magnificent West MacDonnells. Why are these people not engaged in the combat of buffel? A Parks and Wildlife Commission sign at the top of the Palm Valley rim walk highlights the absurdity of the situation: “While introduced grasses have helped to stabilise the banks, they leave little room for seedlings to emerge and survive,” says the sign. Looking down into the magnificent valley there is little evidence the “joint management partners and volunteers are working together to remove introduced grasses from around the palms, giving young seedlings more opportunity to grow,” as the sign claims. No wonder there has been a dramatic decline in the number of palms. As on-site research by the News revealed last week, there is buffel all along the valley. In some areas it is waist-high. It is especially thick around the trunks of the mature palms. Buffel is interspersed with couch – also an introduced grass. In their strategic plan the SA authorities don’t mince their words when it comes to buffel. A formal weed risk assessment of buffel grass demonstrates a high to very high risk for both arid rangelands and native vegetation land-uses in South Australia. It forms dense monocultures, changes fire regimes, and displaces native plants. Although it has been planted for pasture development in other states, productivity of buffel grass dominated pastures can decline in the longer term. Buffel grass has several qualities that enables it to survive and persist in harsh arid conditions: in addition to prolific seed production and opportunistic germination, buffel grass has a deep root system that enables it to access water supplies faster and for longer than most native herbs and forbs. Individual tussocks have a long lifespan and can readily re-sprout following fire. Once established, there is no single control method available for the successful management of buffel grass over extensive areas. The potential value of buffel grass for livestock production is offset by its serious conservation and social impacts. It has been identified as a “transformer weed” of the Australian rangelands due to its ability to transform the basic attributes of habitats. Modelling suggests buffel grass could establish in over 60% of mainland Australia. North of Coober Pedy buffel grass is widely dispersed across the landscape, while south of Coober Pedy the Stuart Highway is its major stronghold and acts as the conduit of spread in an otherwise relatively buffel grass free landscape. Eradication of buffel grass from the Stuart highway and other roadside verges south of Coober Pedy is therefore an important step towards minimising further spread. The program started in 2007 and, by the end of 2010, the Port Augusta to Pimba roadside had been sprayed three times, the Pimba to Glendambo stretch twice and the Glendambo to Coober Pedy stretch once. In a June 2010 roadside survey very few live buffel grass plants were found along the road verge from Port Augusta to Pimba, even after good rainfalls in the area, however after ongoing extensive rains late in 2010 and early 2011 regeneration of buffel grass was moderate both on the Stuart and Eyre highways, demonstrating the need for ongoing management. All photos by the News, showing buffel infestations in Palm Valley last week. 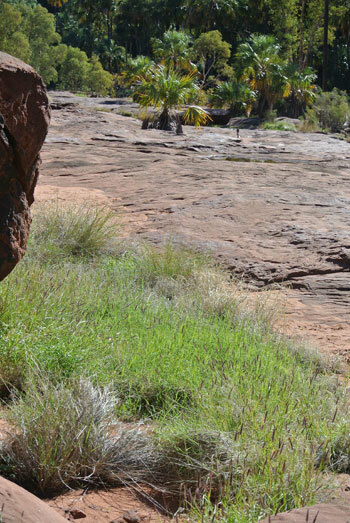 “Buffel grass is widespread in Central Australia and is a recognised environmental threat by the Finke Gorge National Park Integrated Conservation Strategy. “This strategy guides the Parks and Wildlife Commission’s weed management so as to get the best results when protecting unique areas such as Palm Valley. Thankyou for writing this article! Buffel is out of control wherever we look. As I noted in a previous comment, the introduction of buffel grass and Athel Pines in the Centre largely parallel one another but the official response to the threats these species pose to the environment could hardly be further apart. It’s hugely ironic (to me at least) that the NT Government has just released a Draft Weed Management Plan – Open for Comment for Athel Pine. By contrast the government’s efforts towards buffel grass control is severely limited (the Alice Springs Desert Park is a noteworthy example) and for the most part tokenistic. Erwin Chlanda is the only journalist locally (and perhaps nationally) to so persistently sound the alarm about buffel grass invasion, and for this he deserves high praise. More’s the pity, however, that all other media remains steadfastly silent in the face of such a massive threat to Australia’s inland environment. The idea of sentencing prisoners to the job of buffel control is a good one. While the cost of eradication is probably too high, national parks etc could benefit from a determined effort to stop the spread of this grass. And while slashing, burning and chipping is great, it is worth remembering that the World Health Organisation warned that the chemical glyphosate (which is herbicide Round Up) “probably causes cancer”. What a shame that buffel has been allowed to take hold in that wonderful part of Central Australia. Once buffel has taken a firm grip on the landscape it is almost impossible to control but it can certainly be prevented from taking that hold in the first place. 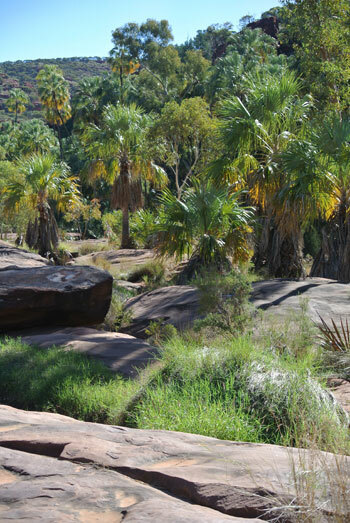 There are other areas of high conservation and tourism value such as King’s Canyon where buffel is allowed to take over unchecked. Shame on the NT Government for sitting on its hands while this is happening. As for Steve Brown and his constant rants about the value of this weed, he is not the man we need to represent us and our precious environment. And I don’t care even if the eradication of buffel does cause billions of people to starve as he claims. The buffel infestation must be combated.